The Fianna Fáil leader says “certainty” around Ireland’s tax policy is vital. Martin says Ireland's tax policies over the past 30 years have been successful. 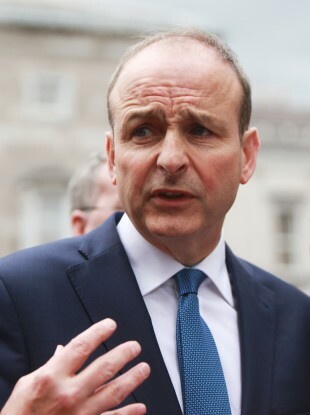 FIANNA FÁIL LEADER Micheál Martin has said that his party will support the government in its appeal of the Apple tax decision. The European Commission ruled on Tuesday that Apple owed the Irish exchequer at least €13 billion in back taxes after it found that Ireland had provided illegal State aid to Apple. The government confirmed on Friday that it will be appealing the decision on the basis that it rejects the commission’s findings. Speaking this afternoon on RTÉ’s This Week programme, Martin said that his party also favours an appeal, calling it “essential”. “We believe an appeal is essential. Consistently, we have been supporting our industrial strategy over the last 30 odd years, we led that in terms of attracting thousands of jobs in opening Ireland up and bringing foreign direct investment in,” Martin said, adding that this strategy has been “successful”. I think it is very important that there is certainly around Irish policy and Irish tax policy. I think it’s important that the independence of the Revenue Commissioners is upheld. Martin flatly rejected the commission’s findings, saying that Irish governments have never given Apple a “special deal”. “I take issue with the terminology and the language used by the commission in terms of the Irish government has done a special deal with a company,” Martin said. Martin also argued that the way in which Apple has developed since 1991, when it’s profits have gone “stratospheric”, has contributed to the issue at hand. “The idea the Irish revenue should be a collector general for Apple’s revenues worldwide is a flawed one,” he said. Martin also confirmed that, while his party is supportive of an appeal, his party would not be contributing to the wording of any such appeal by the minority Fine Gael-led government. “The decision to appeal is an executive one and I’m very clear on the demarcation of the line between the government and the Dáil in that respect,” he said. Email “Micheál Martin on Apple tax: "We believe an appeal is essential" ”. Feedback on “Micheál Martin on Apple tax: "We believe an appeal is essential" ”.